The first reaction above is the inverse β-decay reaction. This example is the chain of reactions that takes place in the Daya Bay detectors; the liquid scintillator used is a 0.1% Gd-doped liquid scintillator. The shower of light is then collected by the photomultiplier tubes (PMTs) placed on the detector wall, producing signals that are sent to computers for analysis. Eight rings of 8" low-background photomultiplier tubes. Reflectors placed at the top and bottom of the detector to maximize signal collection and even distribution. Photocathode coverage is 5.6% (12% with reflectors). The near detectors are placed close to the nuclear reactors to measure the flux and spectrum of for normalization; this reduces the reactor-related systematic error. 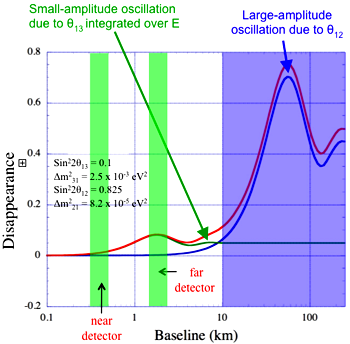 The far detector is placed near the first oscillation maximum (distance of the largest oscillation probability) to achieve the highest sensitivity. This also has the advantage of reducing the effect of θ12. 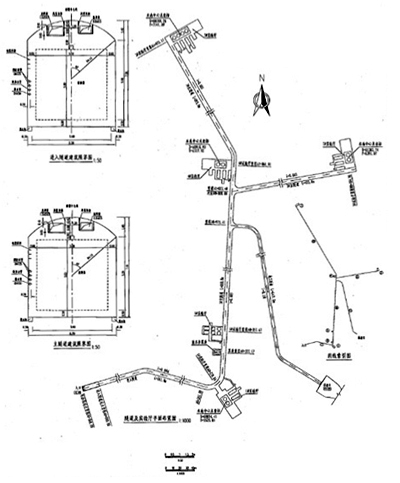 Total length of the tunnels is about 3100 m. There are three underground experimental halls. One of them is located at a distance of about 360 m from the reactors of the Daya Bay Nuclear Power Plant while the other one is positioned at about 500 m from the reactors of the Ling Ao Nuclear Power Stations. The far hall is about 1.8 km from the six reactors.